There's been a great deal of speculation regarding Monmouth Festival's second stage so we thought we'd let you know what's happening. The support and goodwill of the people of Monmouth is very important to the longevity of Monmouth Festival but possibly even more essential to the continued success of the Festival is the practical and financial support that the Festival receives from many Monmouth businesses. One such business is The Three Horseshoes, Monmouth. Back in 2008 when the Festival was struggling to find a venue for its second stage Sam stepped in to the breach and offered the function room at the Three Horseshoes. This became, not only the permanent home of the second stage but, the meeting place for the Festival Committee. 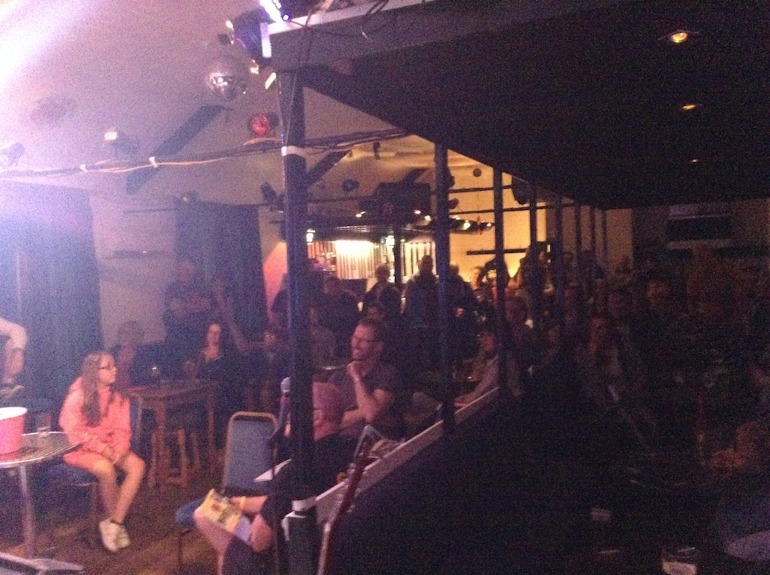 During its ten years the Three Horseshoes stage has developed a well deserved reputation as a venue for up and coming talent with particular emphasis on singer-songwriters. The Shoes programme has always been highly anticipated as an exciting mix of new, existing, local and international talent. It is therefore with great sadness we announce that, due to the ongoing sale of The Three Horseshoes, our second stage will be moving. We would like to say a heartfelt thanks to Sam and Bev. Their willingness to provide a venue for the second stage, their support, generosity and friendship has meant a great deal. We appreciate and value their cooperation and all that they have done for the Festival. We wish Sam and Bev all the very best for the future and hope that we continue to see them at the Festival. The Three Horseshoes line up had a real indie, folk, singer-songwriters feel to it. Running from Day 3 (Monday) to Day 8 (Friday) there were some amazing performances in this intimate setting. Joseph & Maia, all the way from New Zealand no less, kicked it all off and their set generated an amazing buzz. Emma Stevens had to rush off straight after her set as she was playing on the Chris Evans breakfast show the following morning. Rhiannon Mair wowed everyone with her song writing abilities. Liquid Confidence were impressive especially as this was their first time playing as a band. The Shoes last night saw some well known faces entertain us, starting with Steve Edmunds and finishing with Earl 'N' Pearl ((a collaboration of some of the areas' top singer-songwriters.